A CV is the most relevant document you have in order to promote yourself to a potential employer. It is your chance to make an impression. Even if you have all the credentials in the world, a poorly written CV will not make the cut. However a well-constructed CV could ultimately land you that dream job. Hunting for a new job is stressful, and that stress really affects job applicants. Unfortunately, a bad CV can end your job search before it even starts. 75% of applicants do not get call backs because their CVs are subpar. You want to tell a clear narrative of how you got to where you are, and how that background is a logical lead-in to your future. Keep it clean, neat, short, and concise. There’s lots of elaborate information on the internet, but as far as we are concerned, simplicity is king (especially, if your counterpart has a 4-second attention span ….). Whether you’re switching to a new industry or just getting your feet wet (and even if you’re not), it’s a good idea to have other eyes on your CV. We know what is required for particular careers; if you’re applying to a neuroscience lab, you’d want to leave in the technical jargon; our experts help you draw the distinction between what’s impressive and what’s pointless, what’s relevant and what’s juvenile. Your CV should be a Conversation-Starter. So no long-winded objective paragraphs that make CVs mega long and fluffy from us. It’s very hard to write your own CV because a CV is a macro view of your life, but you live your life at the micro level, obsessing about daily details that have no bearing on your CV. So we help you think and rethink the goals of your CV, and word it in the way that connects most to your future employer. 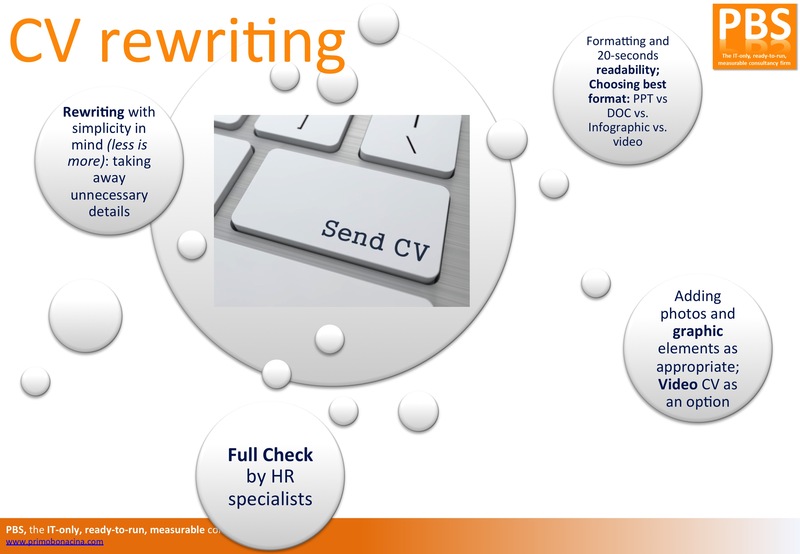 So in case you want a new job, or you want to present yourself as an expert, pick up some side work, or a promotion comes Up at work, our CV rewriting service serves you well. Be sure to rewrite your CV today. Contact us!